Adaptations of novels or stories often suffer in a different media, and adaptations of famous works suffer from over-reverence. Compare the tame filming of the novels of Graham Greene with the film script written by Greene himself (The Third Man). Like Greene, Berkoff understands the essence of the story and the power of the medium. Berkoff´s adaptations and direction are spectacular theatre. An explorer (the outsider) is given a demonstration of a torture instrument by the officer. The prisoner, who cannot speak their language, watches on as the officer describes with pride the instrument that he and the former Commandant developed. He points out the needles and the mechanisms for removing the blood as the needles pierce the skin. And the needles are designed to carve words on the body of the prisoner. This would take twelve hours and the prisoner is able to watch the text being carved as skin is ripped apart by mechanical fury, and slowly the words take form and he understands why he is being tortured. The officer is the last of his breed. The new commander is not in favour of the instrument and spare parts are hard to find. He fears he will no longer be able to carry out his duties. A powerful Kafka piece adapted well by Berkoff. Photo (detail) by Cordelia Weedon from playbook. 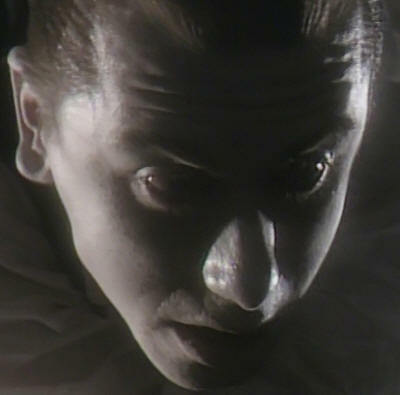 What do Roman Polanski, Tim Roth, Steven Berkoff and Mikhail Baryshnikov have in common? There have all played Gregor Samsa in Berkoff´s adaptation of Kafka´s novel. The play is visually stunning as the actor/beetle crawls and writhes in a metal frame, something from a school playground, symbolising his multi facetted body. Berkoff says "what it did for me was to allow me the scope to explore, experiment and extend my vision and, finally, to be responsible for my own creation". I saw it in The Czech Republic, in a theatre close to one of the many Prague houses Kafka lived in. The writing, both language and pace, match the visual beauty. In Kafka´s tale "as Gregor Samsa awoke one morning from uneasy dreams he found himself transformed in his bed into a gigantic insect". Just as Gregor´s emotions and movements go from those of a human to those of an insect, so the family move from horror and sympathy to ultimate betrayal either by violence (the father throwing an apple which lodges into Samsa´s body) or to the harder betrayal by Samsa´s loving sister who initially was the only one prepared to help him and feed him. The play ends as the sister emerges into womanhood with a bright future, and Samsa is dead. There have been a number of metamorphoses. 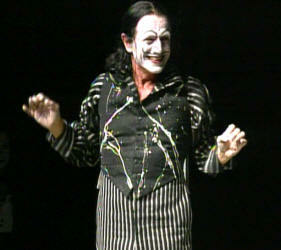 Berkoff´s play uses mime. The family often close together and take the form of a giant insect. The stage is bare but for the metal frame, lighting gives the effect of inside and outside Gregor´s room. 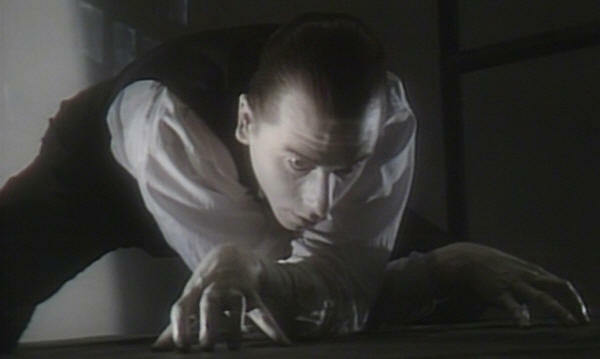 One of Berkoff´s best adaptations. 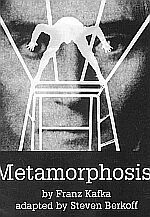 In Meditations on Metamorphosis Berkoff writes about the production in Japan. This book is recommended if you have seen the play as it gives many insights into the staging and the subtleties of the six characters. Berkoff has also recorded the Kafka story (rather than Berkoff´s adaptation) on cassette. Photo (detail) Martha Swope from Meditations, Berkoff quoted from Meditations. Wait! There must be some arguments in my favour that have been overlooked. Wait! Where is my judge? Whom I have never seen. Joseph K is charged with a crime and brought to trial, but he never finds out the charges and sinks under helplessness of not knowing. Berkoff was teaching at the Webber Douglas Academy of Dramatic Art and needed a piece for twenty students. So he turned to Kafka's novel and workshopped it. Berkoff says "Kafka expressed me as I expressed Kafka. His words stung and hung in my brain". In the premiere in the Oval House, London 1970, Berkoff played the role of the painter Titorelli "thank you very much. I got stuck inside a self-portrait". Bill Stewart was Joseph K. In the National Theatre version Berkoff was again Titorelli, and Alan Perrin played Joseph K.
"It was eight o'clock/ the city came to life/ Someone must have been lying about Joseph K:" and so K finds himself arrested and awaiting trial but has no idea why. And K will never find out why, he sinks deeper and deeper and flails trying to escape. 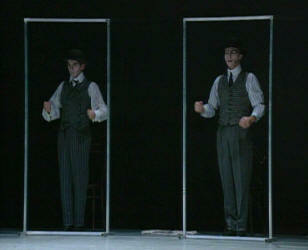 The play does convey the doom, but does it with great humour and flair, mime and acting, making the contrast the greater. 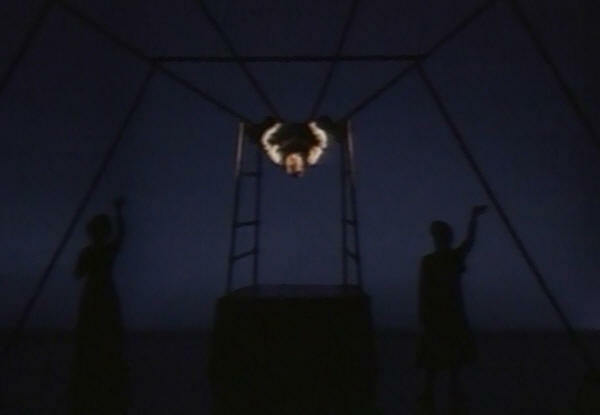 Berkoff´s staging uses frames and a rope and otherwise a bare stage. He originally was going to use screens but when the bare frames arrived he realised on stage you could hide behind an open frame as well as a covered screen. The frames can be turned into never ending corridors, and the rope traces out the route as Joseph K vainly tries to find his way out of the legal maze. 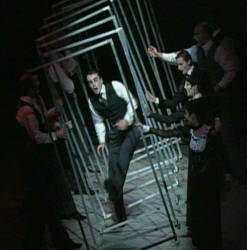 The chorus voices the stage directions "He steps over the inspector" as the characters mime action. When staging, it is important to avoid any hesitation in moving the frames- there should be no pause in the change of scene, the action should flow smoothly, if necessary with the next scene starting before the fames are all in place. Berkoff says he based his role of Titorelli on Salvador Dali (from the interview on The Trial DVD). Berkoff does staged reading of Kafka´s works such as The Judgement and very short writings such as Knock at the Manor Gate. Originally a collection of Kafka´s minor writings including The Bucket Rider were performed together as a prologue to Metamorphosis. 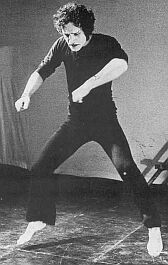 The photo is of Berkoff performing Knock at the Manor Gate, as a companion piece for Metamorphosis (from Free Association).